So the whole postpartum parenthood thing is all really strange. Three weeks ago, this mini-human was living it up in what probably felt like an eternal summer, kicking my hip bones for fun. It’s like I’ve known her and her sweet little personality since she started growing in my womb. Having her finally with us is like hanging out with a long-time friend. Strange, I’m telling you. She’s been stubborn since the very beginning, hating most of the food I ate, kicking me so hard that I had to have an ultrasound to make sure all my organs were okay, and kicking all the monitors off throughout labor and delivery. She also refused to come until April 15th, which I totally expected from the moment I figured out my due date. 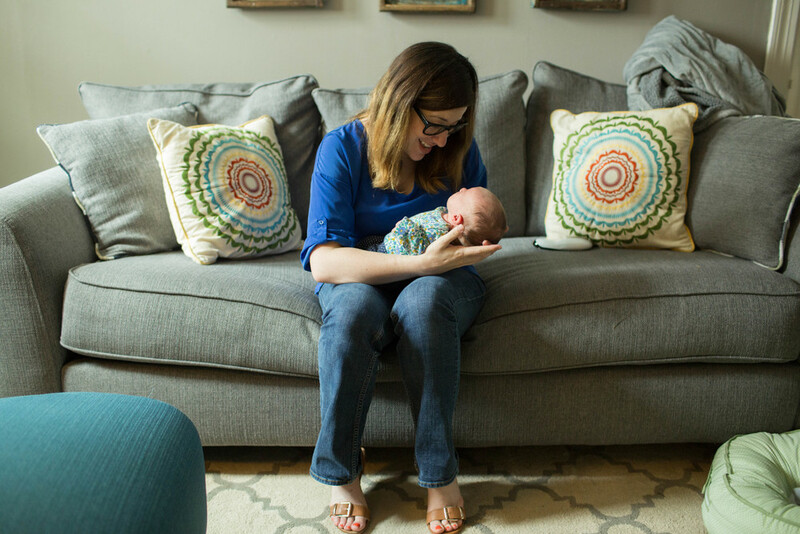 She was due on the 18th, but I started having contractions weeks before she was born – which my doctor said didn’t count if they didn’t hurt… so we’ll just count the ones that started around 3am on the 14th. So here's how it all went down... without a ton of details... and mostly written just so I'll remember for years to come. We got Caleb to day care that morning and grabbed some breakfast. We waited it out a while (I’d like to spend the smallest amount of time at the hospital as possible) and finally went to the hospital around 11am. My contractions were low and in my back, so they weren’t registering on the chart well. The nurse made it pretty obvious that because of this I was probably going back home to wait it out… (No nurse lady, they really do hurt. No, I don’t have a zero pain tolerance.) Until she realized I had progressed quite a bit while sitting there. Off to labor and deliver we go… for forever. I think we watched 12 episodes of Flip or Flop. So, I had been convinced Nora Kate would come on the 15th from the beginning, but I was TOTALLY FINE with her coming on the 14th. I was so sure she wouldn’t take twelve hours to arrive. Again – totally fine with beginning wrong and her coming quickly. I welcomed it, but nope. Progession slowed, and she waited until about 7pm to kick it back up. The nurses kept asking if I wanted an epidural, and I was like, “This isn’t so bad. I’m good. Maybe I’ll do this whole thing without medication.” Until we reached the 6-7cm dilated point and I was sure I was dying. STICK ME IN THE BACK, NOW! Y’all. Don’t wait to get an epidural until it’s unbearable. It takes about 45 minutes to get it ordered and done, so seriously. This is a public service announcement. Past that, I felt like I was able to enjoy the process. It’s beautiful. The nurse called the doctor who was about 20 minutes away around 10:30. We were inching closer and closer to the 15th, but the nurse thought that we’d have a baby as soon as the doctor arrived. Oh no. Our stubborn little girl decided to just stop. Completely. I was already pushing and things were going well, when my contractions spread out to more than 10 minutes apart. Seriously? What is going on? Oh, she’s just waiting until after midnight. We’ll wait. Clock struck midnight and contractions start picking up again. Eleven minutes later we have a beautiful little girl. So, 17 years earlier on April 15th, my dad passed away from Hodgkin’s Lymphoma. I don’t want to over-spiritualize this, but it was cool to see God redeem this day for us: to remind us that in both life and death, He is in control. God is certainly working in all the details of our lives. It just seemed like an appropriate end to the journey of pregnancy and beginning of parenting Nora Kate. I held her on my chest for as long as they’d let me… well, until they allowed me to eat something (Eat before you go to the hospital, y’all. That lukewarm turkey sandwich and animal crackers were like a king’s feast!). By 2am we were in recovery… staring at her and looking forward to the world waking up so we could share this new blessing with them!